Freddie Mac's Regulator 'Completely Puzzled' By Allegations Of Conflict : The Two-Way Nothing immoral went on, Edward DeMarco says. The agency's multibillion-dollar bets against homeowners being able to refinance were "ordinary business transactions." 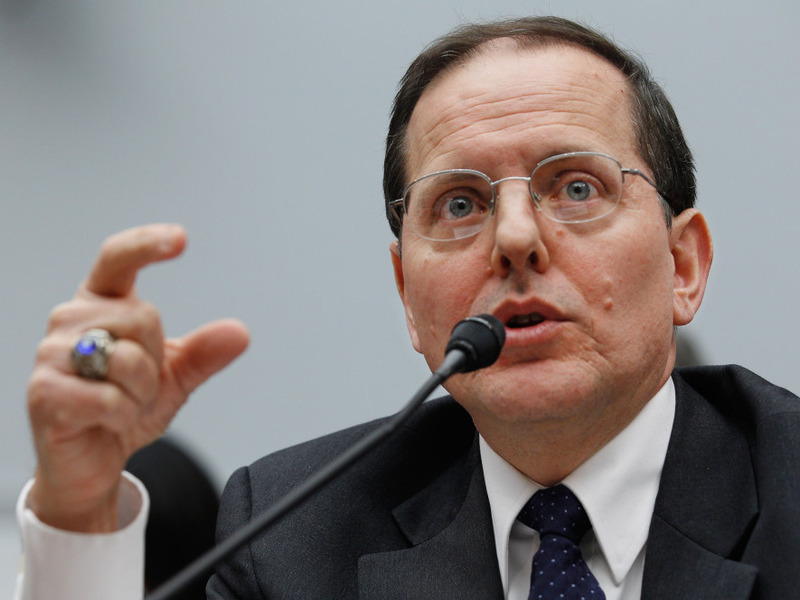 Federal Housing Finance Agency Acting Director Edward DeMarco during testimony before Congress in December. Saying he is "completely puzzled by the notion that there was something immoral that went on here," the man at the top of the agency that regulates Freddie Mac has explained why he believes the taxpayer-owned mortgage company did nothing wrong when one of its arms, as NPR and ProPublica have reported, "placed multibillion-dollar bets against American homeowners being able to refinance to cheaper mortgages." Edward DeMarco told Morning Edition co-host Steve Inskeep in an interview broadcast on today's show that Freddie Mac's actions were "in the class of ordinary business transactions." The "reverse floaters" in Freddie Mac's investment portfolio, which as NPR has reported "brought in more money for Freddie Mac when homeowners in higher interest-rate loans were unable to qualify for a refinancing," did not affect the agency's efforts to stabilize the mortgage market, DeMarco said. Instead, DeMarco characterized the investments as part of Freddie Mac's effort to make sure it doesn't lose money. And he said one of his major responsibilities, is to "make sure Fannie Mae and Freddie Mac undertake activities that don't cause further losses to the American taxpayer." DeMarco is acting director of the Federal Housing Finance Agency (FHFA) — the agency that regulates Freddie Mac and Fannie Mae. As we reported Thursday, two key senators "who have taken the lead on legislation aimed to help homeowners refinance at historically low interest rates," are critical of FHFA's oversight of Freddie Mac. One of them, Democratic Sen. Barbara Boxer of California, laid much of the blame on DeMarco and accused him of not looking out for American homeowners who want to refinance at today's historically low interest rates. DeMarco told Steve, though, that "not only I, but my staff think of the average homeowner on a daily basis" and believe that their efforts to stabilize the mortgage market and prevent losses at Freddie Mac and Fannie Mae are good for all Americans in the long run.